The Sabah Rubber Smallholders Association (SRSA) says it is time the state government adopted an open market policy on raw rubber sales in the state. SRSA president Chua Men Nam, commenting on the plight of the rubber smallholders in Sabah, said dissatisfaction over “low” prices fixed by the Sabah Rubber Industries Board (SRIB) for the commodity is paving the way for a thriving black market. He said the low prices as well as an export tax had forced some rubber smallholders to smuggle out their raw rubber through the backdoor for a better profit. Chua said SRIB should be able to assess the worth of the smuggled raw rubber based on its available data on the total annual rubber production for the state, against the 10% duty collected by the state government. To stop this activity, SRSA suggested that the state government abolish the 10% export duty for raw rubber from Sabah and allow rubber smallholders to sell the raw rubber to factories in the peninsula directly. 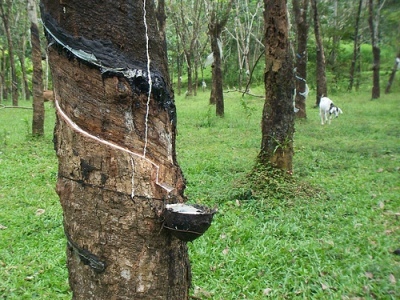 “Many rubber smallholders considered the current charges as exploitative which does not benefit the state rubber industry at all,” he said. “We have our own cooperative. We can always organise ourselves to sell the raw rubber to the peninsula directly. In the end, we just want to ensure the smallholders are getting a fair and better price,” he added. SRSA is already discussing a possible joint venture with the private sector to set up its own processing factory to purchase raw rubber from rubber smallholders, if the state government adopts an open market policy. Chua said that by adopting an open market policy, it would encourage the private sector to set up rubber processing factories in the state and help create a competitive market for the state rubber industry. Under the present set-up, rubber prices determined by SRIB is much lower than that offered by factories in Peninsular Malaysia and Sarawak. SRIB has said the high processing fee imposed on the state rubber smallholders is due to logistics, high electricity charges and high freight charges as a result of the cabotage policy. However, Chua scoffed at the claims and questioned how Sarawak could afford to give a better price to the rubber planters there, despite the fact that they, too, are having the same problems as Sabah. “The difference in rubber price between Sarawak and Sabah is RM1.50 to RM2 per kg. Even a difference of 10 sen makes a huge difference, especially if based on our annual production of about 70,000 to 80,000 tons. “If it is calculated on RM1.50 per kg, our (rubber smallholders) losses is about RM1 million. Hence, many rubber smallholders prefer to sell their raw rubber to Sarawak,” he said. In Peninsular Malaysia, most of the rubber-processing factories are owned by the private sector and they imposed a processing fee of between 70 sen and 90 sen per kg on rubber smallholders. “SRIB charges as much as RM1.60 per kg despite being a government agency that is supposed to be service-orientated. We demand the SRIB to explain on how it determines the rubber price in Sabah,” Chua said. He also reminded SRIB general manager Harris Matthew that in 2003, it used to deduct 70.2 sen only from rubber dealers who collected the raw rubber material from the rubber smallholders and sold it to SRIB. This allowed the rubber dealers to make at least RM1 per kg or RM1,000 per ton. Chua also said many rubber smallholders in the state are puzzled that SRIB claims that it is not only not making a profit but also facing financial constraints, despite having imposed such a high processing fee on them all this while. He recalled that last year the state government had to inject RM60 million into SRIB, so that it could continue to purchase rubber from the rubber smallholders. At one stage, SRIB even owed the rubber smallholders up to three months, he added. “We urge the state government to open the rubber market and break the monopoly by SRIB,” he said. There is only one private-owned rubber processing plant in operation in Sabah. Sited in Keningau, the factory which has operating for about five years is only processing “in-house” rubber to be sold to Kuala Lumpur. “Unfortunately, it is also following the price set by the SRIB,” Chua said. “We also want an open debate with SRIB on this issue; the sooner the better,” he added. If what the Sabah Rubber Smallholders Association (SRSA) claimed is true, then it is only fair that the Government do the right thing to benefit the people; the smallholders in particular. Paddy planters and fishermen get assistance from the Government. The smallholders deserve similar treatment. What do you think? Fair enough?